It’s not always easy to tell whether you have a black piranha, since these fish can easily be mistaken for other kinds of piranhas, especially when they’re young. To add to the confusion, Serrasalmus rhombeus goes by several names: the redeye piranha, the spotted piranha, the Caribe amarillo and even the white piranha. Immature specimens can be impossible for a novice to identify but, as they mature, a few characteristics become obvious that will help you to determine whether yours is a black piranha or not. 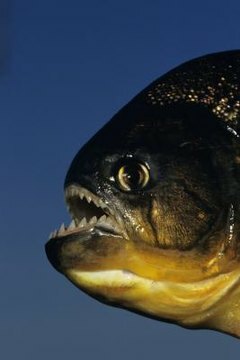 When black piranhas are young, they are easily mistaken for other piranha species because they are light, almost white. Juvenile black piranhas have spots running the length of their bodies, typically on their backs and often covering both sides, especially when they are very young. As they age, the fish typically get darker overall, and the spots begin to disappear. The body of an adult black piranha is usually dark gray or black, but some individuals never lose their juvenile coloration and remain quite light throughout their lives. One of the most distinctive features of black piranhas is eye color. When these fish are young, their eyes are dark like those of other piranhas, making them especially hard to identify; but as black piranhas mature, their eyes turn a deep fiery-red. Eye color usually changes around the same time that body color begins to change, typically when the fish are about 5 inches long. The red eyes are easy to see, making them a simple way to distinguish the black piranha from other members of the piranha family. The more than 30 different species of the Serrasalmus genus cover a wide range of sizes. The black piranha, sometimes incorrectly called Serrasalmus niger, is a good-size fish, averaging about 16 inches long in adulthood. Slower-growing than many other piranhas, the black piranha typically grows no more than an inch or 2 per year and may take almost a decade to reach full size. Black piranhas are by nature solitary fish; aquarium specimens are best kept by themselves. If you attempt to keep multiple piranhas together, mature black piranhas may attack and kill their tank mates. This distinguishes black piranhas from other types of piranhas, which will typically live together happily in small schools. Black piranhas may tolerate the presence of other fish if kept in tanks larger than 100 gallons; but in most cases, they are best kept alone to prevent injuries and possible death.